This time, my blogging break is due to having an actual life! - amylicious! So I've been gone, I know. I haven't posted in a while. That's my friend Cara with me. We took a bunch of fantastic pictures with Disney characters. I love Cara so much, haha. 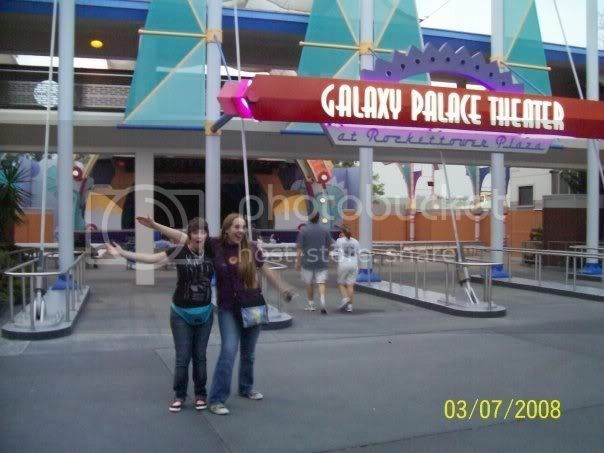 And, of course, we romped around the parks. It was magical, beautiful, wonderful. There's no place like Disney World. The day after returning, Michelle and I played our first wizard rock show at the library downtown. Yeah, I wore my Mickey pirate ears. I was (and still am) on a Disney-high. But oh man. It was amazing. Some people actually knew the words to one of our songs! And afterwards, people wanted pictures with us! And we got to sign someone's guitar! And we sold CDs! Add to my Disney-high a Wizard Rock-high and, man. I was just going crazy with love. We played with a very lovely band called Tom Riddle And Friends. And by lovely, I mean hot hot hot. How about one more, yes? *heartflutter* After they were done, they came and chatted with Michelle and me and we hugged them and all that was going through my mind was, "IS THIS REALLY HAPPENING." I am such a hormonal teenage girl. After TRAF was Gred & Forge. He is so hilarious. And at the merch table afterwards, he gave me a copy of his CD for FREE. How cool is that?! But after him was The Remus Lupins, one of the more well-known Wizard Rock artists. Alex Carpenter is so amazing. This wizard rock show? The best I've ever been to. Yes, because I was in it. But, I mean. To be on the other side of the curtain, to be one of the bands instead of just one of the fangirls (well, in my case, both now)? dkjsfdmk. So happy-making. On Wednesday, our orchestra attended festival (straight Distinguished scores! ROCK!) and then had our concert on Thursday. My last high school festival. Next-to-last high school orchestra concert. It's starting to dawn on me that this is my last semester of high school. I'm so going to miss this orchestra when I leave for college. hfjiksjf. Stopping with the sadness right now. Friday was Pi Day. We had a party in orchestra for the end of festival and for Disney World and stuff, in which I ate a small piece of cake, a brownie, a few cookies. It was bad. Then it got worse, because in Calculus, we had pie. I had two small pieces of pie. dfjikf. So much eating. Then at home, my sister and I made pizza (it's a type of pie!) and strawberry pie. We just used this Chef Boyardee box mix stuff, where you make your own dough and then it has some crappy cheese and pizza sauce. Yeah, we put on better cheese and some pepperonis. Delicious. Working on the strawberry pie, our first (store-bought, of course) crust kind of... failed. Epically. So we had to go out and buy another crust. Graham cracker crust probably isn't the best for strawberry pie, but we dealt. It looks kind of messy (and a little too sharpened in this picture, sorry — it was blurry! ), but it was delicious nonetheless. It kind of fell apart on the plate, haha. And, all right. Yamapi had to make an appearance on Pi Day. Yamapi. Pi Day. IT WORKS, ALL RIGHT? So I made this image of Yamapi's head on a strawberry pie (cough, fueling my need for strawberry pie) and then printed it out and put it in a pin. Which now is on my backpack. dfhkjsd. You love me, don't lie. So now I'm at Saskia's house, where we've been chilling, making cookies, chilling, watching a video on volcanoes, chilling, listening to music, chilling. Tomorrow, we're going for brunch at Alfalfa's and then I'm going to the Apple Store in Louisville (the hard drive on our family computer has crapped out, and so what better time to finally visit the Apple Store?! Which, by the way, could most definitely be renamed Heaven).